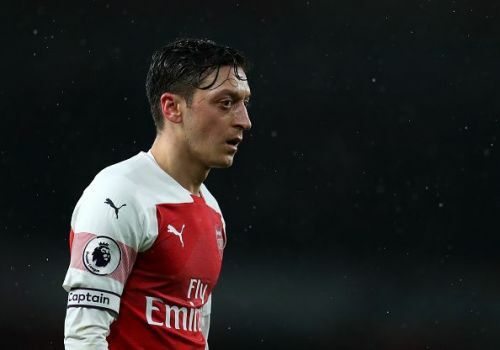 Former Manchester United and Newcastle striker Andrew Cole has weighed in on the controversy surrounding Mesut Ozil at Arsenal, stating that it is beginning to look like a comedy sketch. Ozil was absent from the team that travelled to Belarus in Arsenal's 1-0 defeat in the Europa League. It's not the first time the German has been missing from the squad as Unai Emery has deliberately excluded the play-maker from important games in recent months. The exclusion has led many to believe that there lies a rift between the club's highest earner and his manager. Ozil has been incredibly professional about the situation, tweeting support immediately after the Europa defeat. "Not the result we wanted, but we still can do it in the 2nd leg and reach the next round! Let’s bounce back at the Emirates especially for our fans", the tweet read. Cole did not hold back when he discussed the situation on The Debate. The former United man said (via Sky Sports), "It's becoming a bit of a comedy sketch at the moment. We know how talented he is." "The manager has decided maybe he doesn't want him in the team, he doesn't work hard enough or whatever, but sometimes when you have that luxury, I think some of the boys in the team would be prepared to work a little bit harder to get him on the ball to produce that magic. "Arsenal over the previous years, when Wenger was there, did that. You've got to play your best players when you need them, and Ozil is one of Arsenal's best. "If you asked Lacazette and Aubameyang: 'Do you want Mesut to play?' They'd say yes all day long, all day long! It's really, really strange." Arsenal appear to be struggling with their consistency and are currently in fifth place on the Premier League table, one point behind fourth-placed Manchester United. The Gunners will hope to pass United when they face Southampton on February 24.